. يقدم Marengo Holiday Park خدمات لا غبار عليها وكل أشكال اللياقة وحسن الضيافة اللازمة لإسعاد ضيوفه. إن واي فاي مجاني في جميع الغرف, خدمة غسيل ذاتية, مطبخ, مرافق مخصصة لذوي الاحتياجات الخاصة, مرافق للشواء هي جزء فقط من الخدمات التي تميز Marengo Holiday Park عن باقي الفنادق في المدينة. تنعكس أجواء Marengo Holiday Park في غرف الضيوف.تلفزيون بشاشة مسطحة, اتصال لاسلكي بالإنترنت, غرف لغير المدخنين, مكيف هواء, تدفئة هي بعض الميزات الموجود في العديد من الغرف. يمكنك طلب اللائحة الكاملة للخدمات في الفندق ومن بينها مسارات المشي, الغوص السطحي, غوص, صيد السمك, ملعب للأطفال. استمتع بخدمات لا يعلى عليها وعنوان ذو اعتبار في Marengo Holiday Park . good place, super locations but our rooms had a lot of ants on the bed.... not too good for the kids. just near to the beach.Easy to see the sunrise. Room is big while price is low. Conviniant to cook. Great location and the staff are super friendly and helpful. Absolute delight to deal with. Had an overnight stay at Marengo Holiday Park and wow it turned out to be the best place we ever stayed on GOR. Beautiful views, reef, seal, birds, awesome staff. 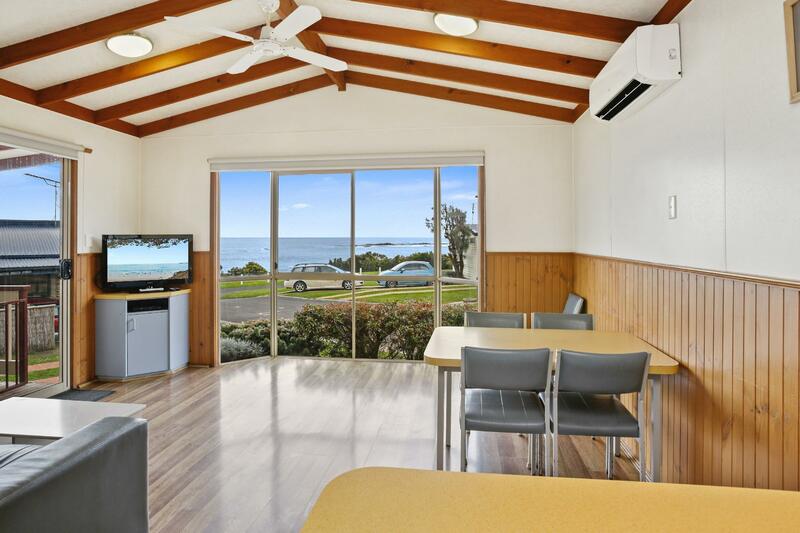 3mins drive to Apollo bay which has shops, restaurants etc. I will love to stay there if happened to be in the area again. We stayed in a two bedroom cabin with a lovely view of the ocean. It was well appointed and reasonably comfortable but not very clean. The floor looked like it hadn't been washed for some time and my feet stuck to it in some areas. There was a lot of mold in the shower, but we have to say it was a very good/powerful shower. Other than the cleanliness issue, it was a good place to stay along the Great Ocean Road. Amazing location, neat and tidy, great value for money! Cabin can be little bit more clean if possible. Location is close to beach with nice rock pools. The bed in one of our 2 bedroom cabin was not ready, not made up when we check-in around 5pm. Kettle provided in the cabin was a bit rusty, cups were dirty. As it is near nature, some bugs/ ants shared my room...was not a problem for me. Lovely birds, right on the water, clean and comfortable. Only minor issues we had were slow internet (also limited to one gig) and the fact that the TV channels kept going in and out (maybe a faulty cable or satellite)? Otherwise, all good and definitely recommended. Great location and view and relax ! Perfect stayed at marengo holiday park. Great location, quiet and peaceful surrounds! Our cabins is facing the beach, beautiful view and walks. The cabins are conformable and have everything you need. We had a relaxing time. Feel very discomfort and insecure. Room wasn't locked when check in. Room being used/not clean before the previous customer.